By far, my favorite place to get in the Christmas spirit is Disneyland. 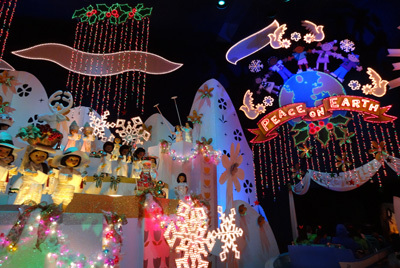 Every year, from mid-November through early-January, the Happiest Place on Earth becomes the Merriest Place on Earth. 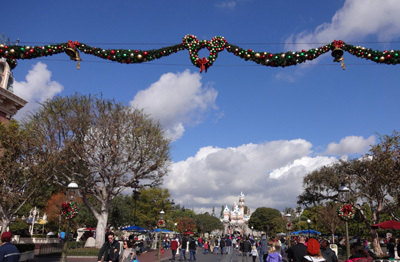 At Disneyland in California, the park isn’t merely decorated for the winter holidays, in many ways it is transformed. The regular parade becomes the Christmas Fantasy Parade; the fireworks show becomes the Believe… in Holiday Magic Fireworks Spectacular; the "it’s a small world" ride is elaborately decorated for the holidays and the dolls sing “Jingle Bells;” and the Haunted Mansion ride becomes, what feels like the completely different, Haunted Mansion Holiday. 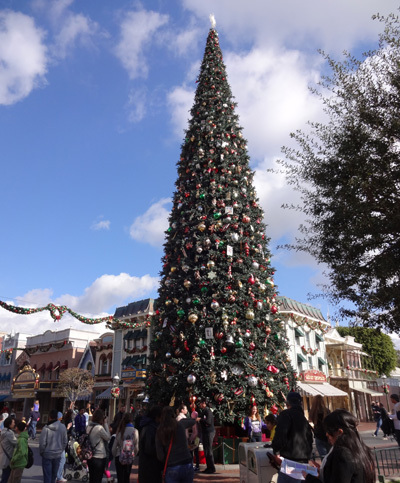 On January 6th, 2013, a friend and I visited Disneyland for the final day of the festivities for the 2012-13 holiday season. Our first stop was Haunted Mansion Holiday. 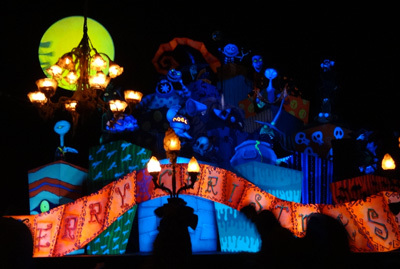 The ride tells the story from Tim Burton’s film, The Nightmare Before Christmas, and includes many of the catchy songs. I like this version even better than the "regular" Haunted Mansion. After a jaunt on Indiana Jones Adventure, an exciting jeep ride through an ancient temple, we stopped by the Dia De Reyes (Three Kings Day) celebration (offered January 4-6th, 2013) behind Big Thunder Ranch. There were character greetings (we saw the Three Caballeros characters); unique foods, like a mini Rosca de Reyes (a ring shaped sweet bread) available for purchase; and face painting, coloring, and paper crowns for the children. On the stage, performances by Disneyland dancers, including Disney costumed characters, alternated with performances by local dance troupes. Next, we headed over to Space Mountain, which had over an hour wait-time posted, to pick up a FASTPASS and then rode Finding Nemo Submarine Voyage. 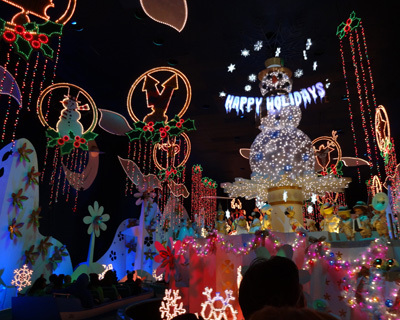 After our voyage through Nemo’s underwater world, we enjoyed the a sail through "it’s a small world" Holiday, marveling at the festive holiday decorations. Back at New Orleans Square, we checked in for our lunch reservation at the Blue Bayou Restaurant and were thrilled to be seated at a table right along the bayou. Soft Christmas music with a New Orleans flair filled the air. We enjoyed the crusty bread rolls, pecan and cranberry salad (chicken gumbo soup was also available instead of the salad), and our entrees (perfectly-seasoned chicken breast with thinly sliced au gratin potatoes and green beans for me and a portobello mushroom with couscous dish for my friend) while we watched the shadows of boats full of parkgoers on the Pirates of the Caribbean ride quietly sail past and “fireflies” dance in the distance. After lunch, we sailed into the world of pirates on the Pirates of the Caribbean ride. And then we went back to Space Mountain, where we used our FASTPASSES to bypass most of the 65-minute wait for a rollercoaster ride through outer space. Then it was time for the second showing of A Christmas Fantasy Parade. We found a spot along the curb on Main Street and watched the sky darken into night. And then I heard the music that I looked forward to every holiday season. 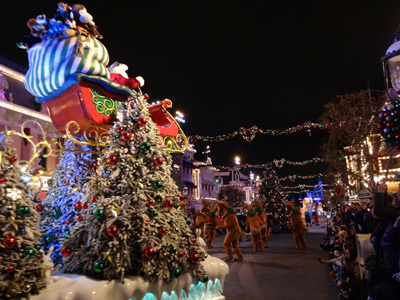 Soon, dancers dressed like elves, snowflakes, and gingerbread men; and holiday-themed floats carrying Disney characters, princesses and princes made their way up the street. At the end of the parade, Santa Claus made an appearance in his sleigh. After the parade was over, because it was a Sunday evening and my friend had to work early the next morning, we headed home. On past visits, we’d seen the exceptional Fantasmic! (with its projections onto screens of water, Disney characters, and fire effects) and Believe… in Holiday Magic (a breath-taking, heart-warming, holiday-themed fireworks show). Although I would have loved to see them again that night, I didn't despair; because we live not far from Anaheim, I knew I’d be back. I did this in 2013 in Anaheim, California, USA.